This class is excellent for participants with minor mobility issues, diabetes, arthritis, osteoporosis or heart disease who are just beginning to exercise or have recently recovered from injury or illness. The program offers a full workout with warm up, gentle cardiovascular exercises, balance, strength and stretching components. The exercises can be done sitting, standing or both. Please bring appropropriate footwear and a water bottle. Chartwell Quail Creek Retirement Residence has sponsored classes during the month of April so there are no costs to participants. They have also provided an opportunity to win a gift basket. Each time you participate in a class, you can enter a draw to win! Location: Renfrew Collegiate Institute, Bonnechere St.
CFUW-Renfrew will hold its annual used book sale Friday, April26 4-9pm and Saturday, April 27 9am to noon at Renfrew Collegiate Institute, 184 Bonnechere Street. Proceeds for local high school scholarships. CFUW-Renfrew will hold its annual used book sale Friday, April 26, 4-9pm and Saturday, April 27, 9am to noon at Renfrew Collegiate Institute, 184 Bonnechere St. S., Renfrew. Proceeds for local high school scholarships. ExtraOrdinary is an eleven artists, multimedia exhibit exploring how the extraordinary can be found in our everyday lives in Renfrew County. Please join us for the launch part at Fifth Chute Coffee on May 2nd from 7 to 9pm Live music with Marc Audet. In-process collaborative art piece with Bozena Hrycyna. Light refreshments. 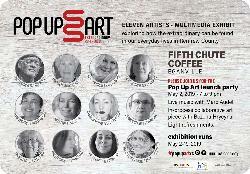 Pop Up Art will be at Fifth Chute Coffee from May 2nd to May 19th. ExtraOrdinary is an eleven artists, multimedia exhibit exploring how the extraordinary can be found in our everyday lives in Renfrew County. Please join us for the exhibition opening on May 23rd from 2 to 4pm In-process collaborative art piece with Bozena Hrycyna. Light refreshments. Pop Up Art will be at Dundonald Hall from May 23rd to June 9th. All are welcome! Friday, April 5th from noon to 6 p.m. Saturday, April 6th from 8 to 11 a.m.
Come and celebrate our 50th Anniversary with the unveiling of the old Cold War Air Raid Siren that used to be outside Town Hall. It has been refurbished and will sound us into our celebrations. Admission is free so tour the museum or hang out at the O'Brien Park and join in the fun.